Print Date and report time in financial reports is a very required feature. Suppose if you have a client with multiple units and dealing with all units and need to reconcile the client statement on monthly basis and sometimes you have to forgot the statement date when client ask you to provide the details. Go to Gateway of Tally - F12: Configuration: Printing Configuration - General. Set Print Date and Time in Reports to Yes. Set Print on all pages of report to yes. If you want to continue print the date and time on each page of a particular report. 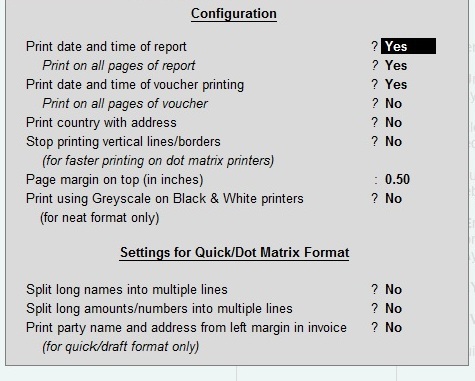 Set Print date and time of voucher printing to Yes. Set Print on all pages of voucher to yes, if a voucher entry contains more than 1 page then date and time will be print on each page. Press Enter to Save .